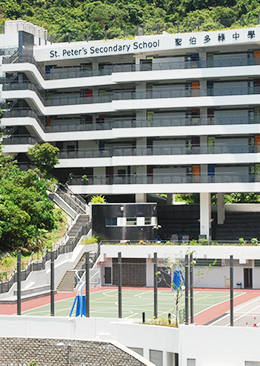 Our school is a Catholic secondary school named after Saint Peter, the Apostle. It is our wish that all staff and students would understand the spirit of the Gospel of Christ, follow the edifying example of St. Peter ---- to be zealous and upright, simple and generous, courageous enough to undergo self-renewal, willing to make commitments, always embracing hope ---- and put into practice the school motto of "submission to truth and upkeep of peace." Following the educational ideals of the Catholic Church, we aim at the formation of the whole person. Apart from transmitting academic knowledge, we place emphasis on moulding the characters of our students, guiding them to develop themselves concurrently in body, mind and spirit, in interpersonal relationship and in social responsibilities, so that each student will grow into a cultured person with a sense of commitment toward the community and the nation. We endeavour to provide an ideal learning environment and a balanced education for our students. The philosophy of "spiritual, moral, intellectual, physical, social and aesthetic education" forms the basis for curriculum design with a view to helping students to acquire multi-disciplinary knowledge and skills, as well as to develop their abilities of independent thinking and sound judgement. At the same time, we also encourage students to participate actively in extra-curricular activities, in order to develop their individual potential, as well as to foster a spirit of co-operation and service.